Sister Sax evening of Jazz & swing, with vocals & sax duo. Classic Jazz entertainment. 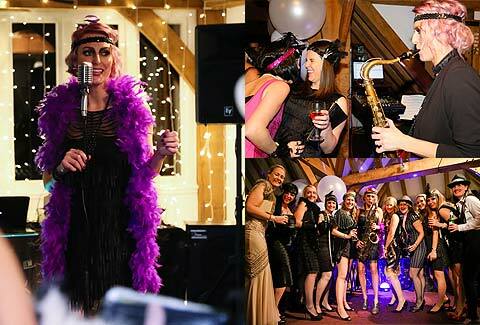 For adding a touch of class to any restaurant, event or occasion, a live saxophonist and Jazz singer will truly take you back in time to an era of inspiring music and excitement. Kay Bedford with her impressive vocals and mellow saxophone sounds will perform a selection of contemporary Jazz songs, with well-known and well-loved swing classics. Kay will add a stylish finishing touch to any fabulous evening. Please see below for a selection of vocal and saxophone Jazzy favourites. An evening of Jazz is available also with the Sister Sax duo. Kay and Holly are the icing on the cake for any Jazz / Swing event.